The goal of this lesson is to provide you with an example of how to use data from a database. In this example, our objective will be to enter a client's address into the bill using a drop-down list. Lookup_value: I2: the cell that contains the client number to search for. Table_array: DB!A:E: select columns A to E of sheet "DB" (note: if you fill out the columns only, rather than the cells, you can enter your database later and you won't have to change any of the formulas). 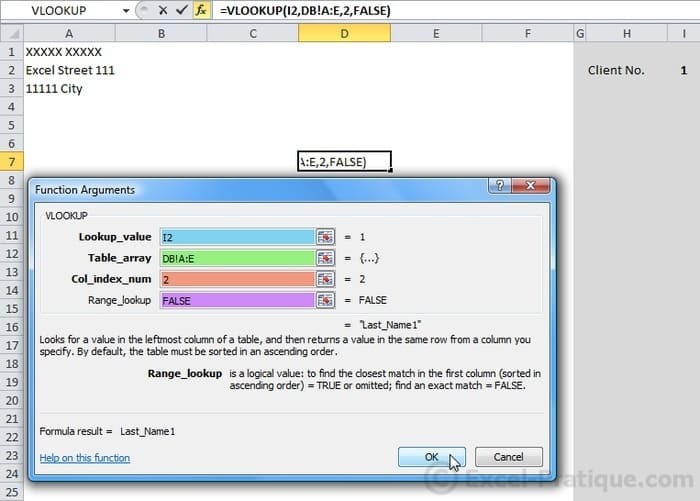 Col_index_num: the column number entered here is the column number in Table_array. If we enter 2, we will get the name, 3, the first name, 4, the address, and 5, the city or town. Range_lookup: FALSE: find an exact match. The name of client number 1 is displayed. Now edit the No_index_col parameter to get all the information. In this intermediate example, A1 and B1 each contain a word. The goal is to return the two words in A2. To concatenate (= assemble) multiple values, use the & sign. The 2 words have been returned in A2 correctly and separated by a space.